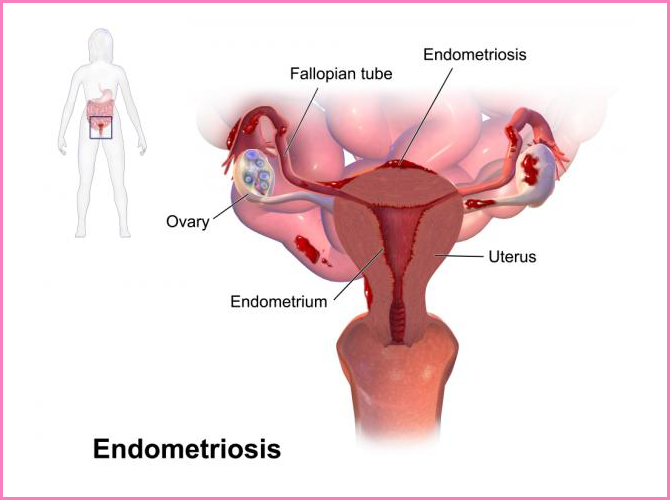 Endometriosis is a hormonal and immune system disease in which cells similar to that which line the uterus (endometrium) grow outside the uterine cavity, most commonly on the membrane which lines the abdominal cavity, the peritoneum. The uterine cavity is lined with endometrial cells, which are under the influence of female hormones. Endometrial cells in areas outside the uterus are also influenced by hormonal changes and respond in a way that is similar to the cells found inside the uterus. Common symptoms of endometriosis are pain and infertility. The pain often is worse with the menstrual cycle and is the most common cause of secondary dysmenorrhea. Endometriosis is typically diagnosed during the reproductive years, but has been diagnosed in girls as young as 8 and has been found to continue past menopause; it has been estimated that endometriosis occurs in roughly 4–10% of women. Symptoms may depend on the site of active endometriosis. Period pain which is usually not as severe, and doesn’t last as long. Pain in the lower abdomen and pelvic area. Sometimes the pain is constant, but is usually worse on the days just before and during a period. Other menstrual symptoms may occur. For example, bleeding in between periods. Uncommon symptoms include pain on passing poo (faeces), pain in the lower tummy (abdomen) when you pass urine, and, very rarely, blood in the urine or faeces. Very rarely, patches of endometriosis occur in other sites of the body. This can cause unusual pains in parts of the body that occur at the same time as period pains.